The freedom to grow marijuana in his apartment led him to think about the potential for others to grow indoors like he had. “I decided that it was so great that I would make these little grow tents and sell them,” he says. That chance intersection happened to be with writer Mel Frank, who would later become Rosenthal’s co-author on the seminal book the “Marijuana Growers Guide Deluxe Edition” – a work that would serve as the bible of bud for many a home grower during the nascent, pot growing days of the 1970s. The guide’s influence became so widespread that in 1978 it garnered a book review by the New York Times and for decades since has been recognized by novice and expert growers alike as the first great work to put cannabis cultivation within the reach of the average Joe and Jane grower. Since then, Rosenthal’s independent publishing house, Quick Trading Company, has sold over 2 million copies of more than a dozen titles on the subject of cannabis ranging from cultivation and seed breeding to hash making. Those books, which are as homegrown as the man himself, have helped to create the colossal U.S. marijuana market we know today – a business that shows every sign of continuing its steadfast march toward massive popularity and sky-high profits. If Rosenthal had stopped at book publishing, that might have been enough to ink his credentials in the pot hall of fame and call it a day. But his story goes far deeper than a couple million books sold. Over the ensuing decades, he would become a cultivation innovator, as well as an influential drug policy figure, and one of the key people credited with developing vital policies of civil regulation for marijuana legalization. Their residence – a modest house on a tree-lined street in the middle of Oakland, California – is the picture of docile, middle-class America. Where other suburban front yards might feature a hedgerow of junipers or a basketball hoop, Rosenthal has taken advantage of the driveway’s southern light exposure and is growing tomatoes and bell peppers in a self-styled, portable greenhouse he calls “Meals on Wheels.” Lately, he’s been working on this home project meant to extend the growing season by a couple months and employs a system of heating the roots through a simple aquarium pump. His plants look well-fed and happy and are in the process of building strong, healthy roots – all in the middle of December. Constructed with 2x4s, castors and plastic sheeting, it’s effective and very simple to put together. And because it’s built on wheels, the setup is portable and can be moved around during the year as the sun’s arc varies. It’s interesting to hear the man whose name is synonymous with growing chronic spend the first 15 minutes of our conversation excitedly sharing tips about growing killer tomatoes and bell peppers in the middle of winter. But I’m realizing that this is the real Ed Rosenthal – an innovative horticulturist who long ago choose a path toward cannabis cultivation over, say, another ag specialist’s choice of corn. Wondering where it all started, I ask him about his first experience with the plant. That little ally is what would take him from his Lower Eastside walkup growing cannabis to pursuing a college degree in philosophy and psychology for “a lot of years” in an attempt to remain ineligible for the Vietnam War draft. After a period working in New York City, in stock compliance of all things, Rosenthal took a leap of faith and moved to San Francisco to fulfill his destiny. “I left my career as a youthful indiscretion to help make pot legal,” he says with a smile. After his arrival in California in 1973 and publishing the “Marijuana Growers Guide Deluxe Edition,” he continued to expand as an author, cannabis grower and advocate for the legalization of marijuana use. With the passage of California’s pioneering Prop 215 in the 1990s, which authorized medicinal use of marijuana, Rosenthal put his expert knowledge of cannabis to work with state and local governments to implement the delivery of high-grade cannabis for patients. But as it would turn out, the protection of that state law was not enough to keep him from being prosecuted. Though he was appointed an officer of the City of Oakland, he was soon alerted by the federal government that the city had no right to tell him that he was free from criminal charges by the feds. Instead of retreating into the shadows and hiding from law enforcement after that encounter, Rosenthal doubled down and continued his activism on behalf of patient rights, keeping his eyes on the prize of his goal after leaving New York. Nothing short of legalization would be acceptable. 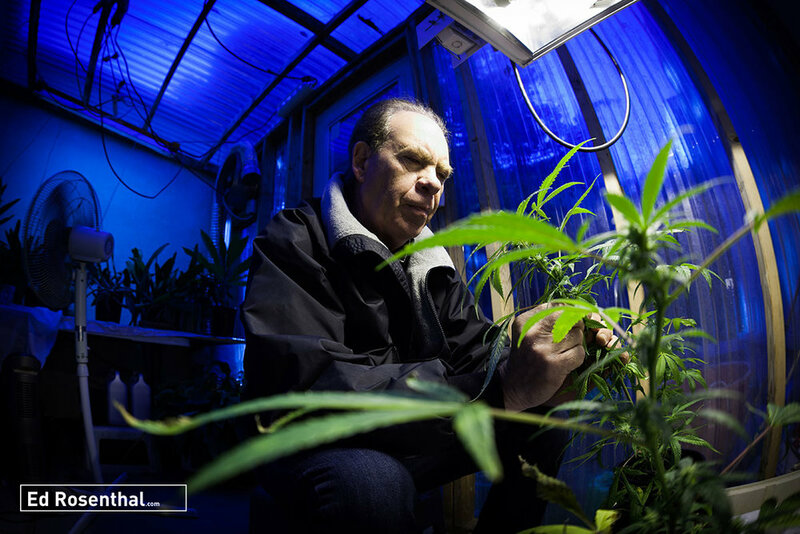 It’s been nearly 40 years since Rosenthal first turned on a generation to the concept of freely growing cannabis at home and his contributions to the industry continue to expand. He’s managed to carry on penning bestsellers like the “Marijuana Grower’s Handbook,” “Beyond Buds” and “Marijuana Pest and Disease Control,” as well as new titles like“Marijuana Harvest” co-written with David Downs – all valuable resources for the avid cultivator. Rosenthal’s also recently made a guest judge appearance on the TV show “The Collective,” a nationwide search to discover the next successful cannabis entrepreneurs, fashioned after the incredibly successful show “Shark Tank.” He’s got a few more exciting innovations in mind, too, like working with a terpene project and creating a special light to increase THC production. And now he continues to make plays at helping cannabis become completely legitimate for recreational use in California. Rosenthal’s vision for the future of California legalization titled “The Marijuana Bill of Rights,” seeks to be a more straightforward road to recreational legalization, cutting through the static that can often confuse voters.